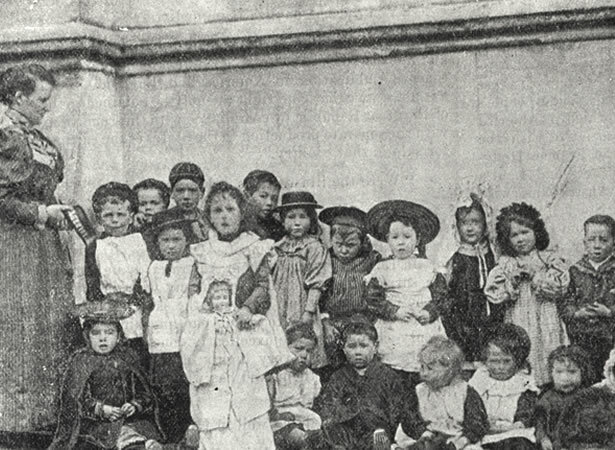 Public concern over rowdy street kids, ‘gutter children’ or ‘waifs and strays’, as they were then known, was a key factor in the establishment of the first kindergarten in New Zealand. Two early kindergartens were Auckland’s Jubilee Free Kindergarten (1887–99) and the Auckland West Free Kindergarten (1888 – c.1893). These early examples were mainly focused on child welfare and had crèches but the Dunedin Free Kindergarten, which opened on 10 June 1889 in the Mission Hall, Walker St, aimed to educate as well as care for the children of the poor. The Dunedin kindergarten was based on the ideas of the German educationalist Friedrich Froebel (1782–1852), whose early childhood curriculum focused on movement, singing games, craft activities (‘occupations’), and activities centred on the use of sets of blocks known as ‘gifts’. Stories were read to the children and they regularly went on outings. Froebel’s methods were thought to encourage both moral behaviour and knowledge of God. There was a strong emphasis on socially appropriate behaviour through play, and children were also taught domestic and self-help skills such as sewing, washing and ironing. Froebel and the Kindergarten movement attracted influential female patrons throughout the world. In New Zealand, Dunedin resident and activist Learmonth Dalrymple petitioned Parliament to implement Froebel’s system. Philanthropist and community leader Rachel Reynolds and private schoolteacher Lavinia Kelsey were instrumental in establishing New Zealand's first kindergartens. Their efforts and those of other women fighting for changes in education, greater democracy and other feminist goals pathed the way for initiatives in early childhood education throughout the colony. Hear Helen May and Kerry Bethell talk about their 2018 publication Growing a Kindergarten Movement in Aotearoa New Zealand. We have 16 biographies, 7 articles, related to First kindergartens.